Went to AMK Library as said in the previous post. 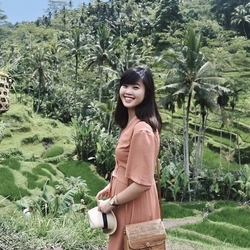 But actually, only went there for a while lah. Ate & did, but gave up in the end. OMG. People were like all staring at us lah. "FEMALE REPRODUCTIVE SYSTEM"
Like who won't ? When theres like this 3 words on the laptop's ppt slide. LOL. 3 HUMOUNGOUS WORDS, or however its spelled. 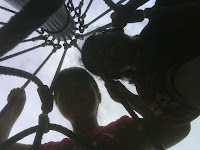 Then went to the Playground with Sham while Charlene & Zikrul continued with their Spider Solitare in Macdonalds. 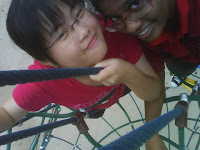 Tried on the "SpiderWeb" for the veryvery first time, thanks to Sham. Then went on to the swings, with the seats wet cause' it was drizilling at that time. But didn't care, sat on it still & started playing. Then ran to the bustop to catch 853 but did not catch it. Waited at the busstop for like 30 plus mintues. Zikrul & Charlene continued their BINGO ! while Sham and I made up silly songs & sang them out loud. 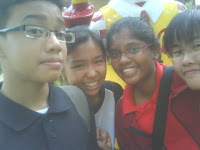 PICTURES :D Love that crown thang <3 Uncle Ronald Macdonald :D with his umbrella. 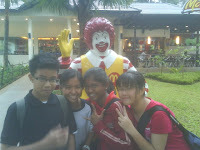 Outside Macdnoalds with Ronald Macdonal :D WE WERE THERE :D hahah, the crazy sham :D WHEEE ! 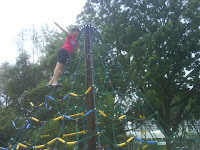 I'm on top of the world :D HEHEEH. LOOK DOWN :D heheh. This is what we call fun :D Bleahs :P RETARDNESS :D Super Duper RETARDNESS :D The art of playing BINGO ! at the bus-stop. Yup, lets end it here, shall we ?